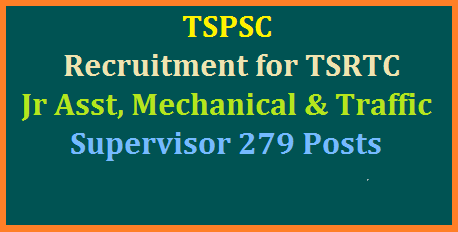 TSPSC will recruit 279 Posts in Telangana State Road Transport Corporation Junior Assistants Mechanical Supervisor Trainees Traffic Supervisor Trainees Posts Educational Qualifications Eligibility criteria Syllabus Examination Online Application Schedule will be anounced by Telangana State Public Service Commission in its detailed Notification Telangana State Public Service Commission (TSPSC) Junior Assistant ... (TSPSC) Junior Assistant required Education Qualifications Details: ... tspsc-tsrtc-junior-assistant-mechanical-traffic-supervisor-trainees-recruitment-educational-qualifications-apply-online-hall-tickets-answer-key-results-download notification to fill up the vacancies of Junior Assistant during the year 2017. Public Services – TR&B Department - Recruitment – Filling of (279) two hundred seventy nine posts in Telangana State Road Transport Corporation (TSRTC) through the Telangana State Public Service Commission, Hyderabad - Orders – Issued. Government have reviewed the Direct Recruitment vacancy position in Telangana State Road Transport Corporation (TSRTC). After careful examination of the proposal furnished by the Department and keeping in view the actual requirement of manpower with reference to the nature of work and activities of the TSRTC and also the overall financial implications, Government hereby accord permission to fill (279) two hundred seventy nine posts in Telangana State Road Transport Corporation (TSRTC) through the Telangana State Public Service Commission, Hyderabad as shown below. The TR&B Department and the Managing Director, Telangana State Road Transport Corporation (TSRTC) shall furnish details of all vacant posts authorized in this order, including the local cadre wise vacancy position, roster points and qualifications, etc., to the recruiting agency immediately under intimation to Finance Department. The Department shall issue necessary amendments to their service rules / Government Orders as regards recruitment procedure / recruiting agency, wherever necessary, before issue of notification. The Candidates must complete 12th class from any recognized board with minimum qualifying marks.See the official notification for more detail. All Interested Candidates should have completed 10th, Diploma in Mechanical/Automobile Engineering, Graduation Degree, Masters Degree, Chartered Accountants, MBBS or its equivalent qualification from a recognized Board/University. For Post Wise Qualification Go To Detailed Advertisement.